Allowing for the fact the scene has well-placed studio lights that are not really consistent with the way the area would look in "real life", the stairs and the ground right in front of them seem to be lit by spotlights up inside the ship, directly above the foot of the stairs. There's also several lights up inside the recess which the "landing pedestal" projects from. In the scene show below from the ID attack, the lights inside the recess (and the studio lights illuminating the outside of the dome) give that area a copper-gold appearance. ~ The caption on page 36 (picture #33) describes the plans to actually build a full-size set which present a lush portion of Altaira 4, through which Robby would drive the crewmen on the way to the Morbius home. The first picture below is from the article, showing the initial design for Robby’s vehicle and the “grand tour of Altair 4” it would have appeared in. The second picture was provided by Butch when he assembled the magazine pages and the great “bonus pictures” he added! Notice the design of Robby’s snazzy hotrod in the two pictures. The caption with the picture from article includes this. The jeep’s design [was going to be] an enclosed vehicle. The sets included this view of a mountain pass, complete with lush vegetation, waterfall (upper right), and a pond with red lily pads. This is another example of just how enthusiastic the entire production staff was about Forbidden Planet! They were eager to build just as much of Altair 4 as they could get away with, right up to including a full-sized set for a brief scene of Robby taking the scenic route to the Morbius residence — instead of the unrealistic idea that Robby’s open, two-seat jeep could streak cross rough dessert terrain at the incredible speeds suggested by the “dust cloud” scenes of his approach and departure at the landing site! 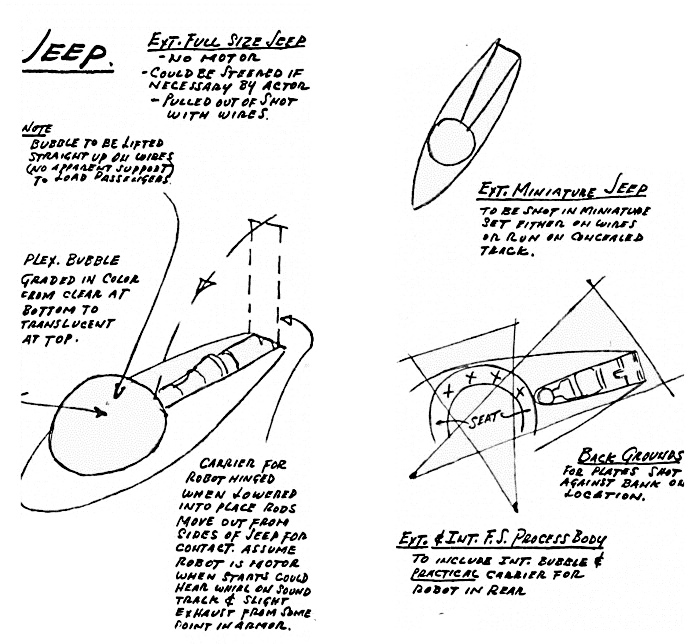 A much more radical (and less appealing) design for Robby’s jeep is shown in a few simple sketches on page 36 (picture #37) which describe the jeep as having a transparent dome for the passenger area and a compartment behind it where Robby would actually lie prone and serve as the jeep’s engine! I’ve rearranged the diagrams on page 36 to fit more conveniently onto this post so you folks can study them here and not have to go back to page 36 in the initial post. Carrier for robot hinged when lowered into place. Rods move out from sides of jeep for contact. Assume robot is motor. When starts, assume could hear whir on soundtrack & slight exhaust from some point in armor. Wow. Robby is lowered into a prone position and placed into a slot behind the domed passenger compartment so he can be both the motor and the driver. What a wild idea! I don’t like it, but I gotta admit, it’s wild! Orzel, I'll concede that the subject of the Moon's delta V is questionable. Angular momentum can act as a brake or a gas pedal depending on the details. Bud I'm willing to bet that the thought of trying to have such a large transparent plexiglass dome made is what killed that design. ~ The caption on page 46 (picture #48) for the diagrams of Robby’s inner mechanisms indicated that even Robby’s final designed was intended to have the “tool belt” attachments shown in an earlier design. 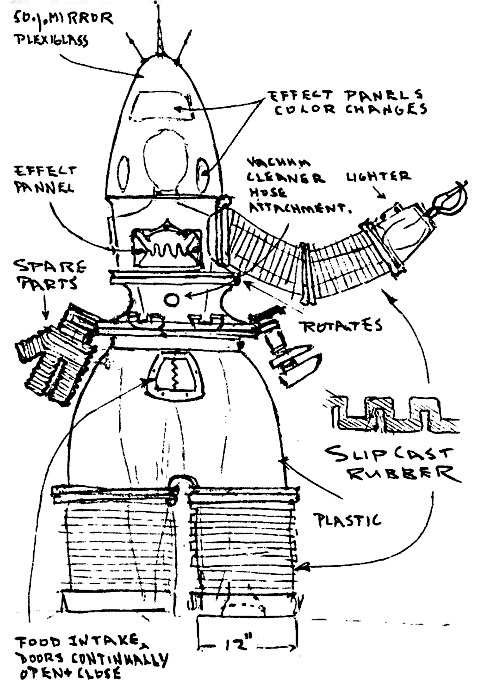 Good Lord, look at some of the attachments Robby would have with this design! A vacuum cleaner attachment, a cigarette lighter, two types of attachable hands, and an adjustable wrench on his right hip! ~ The caption on page 46 says the final Robby design actually included a beverage dispenser, a cigar lighter, and a pair of pliers (the flat rectangular blades which open and close like scissors). Only the pliers were used in the movie, during the final scene when Robby pilots the ship. ~ The caption on page 50 (picture #50) with the construction diagram which shows all of Robby’s sample hopper states that the initial castings of the body parts where made of a less durable plastic than it needed, and Robby’s legs would crack from the weight! The body parts were recast in tough Royalite and this solved the problem. Royalite is orange, however, so Robby had to be painted metallic gray to prevent Robby from looking like a giant walking can of Orange Crush. ~ Page 52 (picture #52) has a caption which mentions that Henry Hillinch painted the matte shot of the Morbius house and the graveyard where the Bellerophon crew was buried, and fellow artist Matthew Yuricich told the authors that he remembered Hillinch complaining about the possible inclusion of a live-action matte element which would show a dust trail from Robby’s car approaching from the upper right. Fortunately, the plan was abandoned. I don’t think that would have looked very convincing . . . The caption also states that the saucer in the eclipse scene was moved with stop motion, which is why the bottom dome's red lights don’t rotate in that scene. The red lights were motorized and could not be hand-turned incrementally for stop motion, so the dome was replaced with a solid red one. Note for Robby model makers: It is almost impossible to find the correct color gray that he was painted. It is from a company long out of business named "Distler" and it was "grey 3435". The plastic that they used to, and maybe still make Samsonite luggage out of. I have my Dad's old gray Samsonite luggage, and where the lining has come loose, you can see the plastic's natural orange color. Remember the old Samsonite commercials with the gorilla in a cage throwing a suitcase around? That's Royalite. ~ The last line in the caption on page 55 (picture #56) seems to confirm my theory that the DC stations turned the crewmen into energy — or perhaps the author was just describing the obvious fact that the men appeared to be turned into energy. Here’s what he says. [Matthew] Yuricich worked as an assistant in the Newcombe matte department, and supplied the airbrush matte art for the effect when the crewmen take their DC stations for the deceleration from hyperspace to the sublight speeds. Newcome enrolled him in a special art class to learn the airbrush technique which transformed the crewmen into glowing blue columns of light energy. “Now everyone uses it, “says Yuricich, referring to the similar design and effect of the ship’s transporters in STAR TREK. As I said previously, I vote for early transporter technology instead of just colorful “seat belts”. As for the diagrams of the tractor design used in the film, frankly I wish they had gone with the preliminary design shown at the bottom. The tractor in the movie is rather low-tech looking. Well guys, that’s it for the whole article and all the picture captions. I hope you enjoyed my comments and you’ll add some of your own. I mean, hell’s bells, why should I get to have all the fun! that the miniatures were constructed by Donald Jahraus' team. (Altair IV ship miniature, Krell shaft, Morbius house when the Id broke in, Lab doorway when id melted the door, etc.) All were filmed by longtime SFX cameraman Maximilian Fabian and his assistant Harold Lipstein.